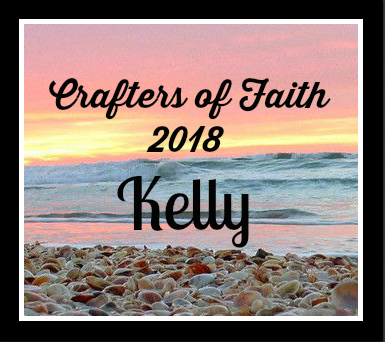 Crafters of Faith: John 7:38! will flow from within them." They are such sweet, sweet ladies! This month, our hostess has taken some time off and so I took her place as hostess. This is my challenge: Water! 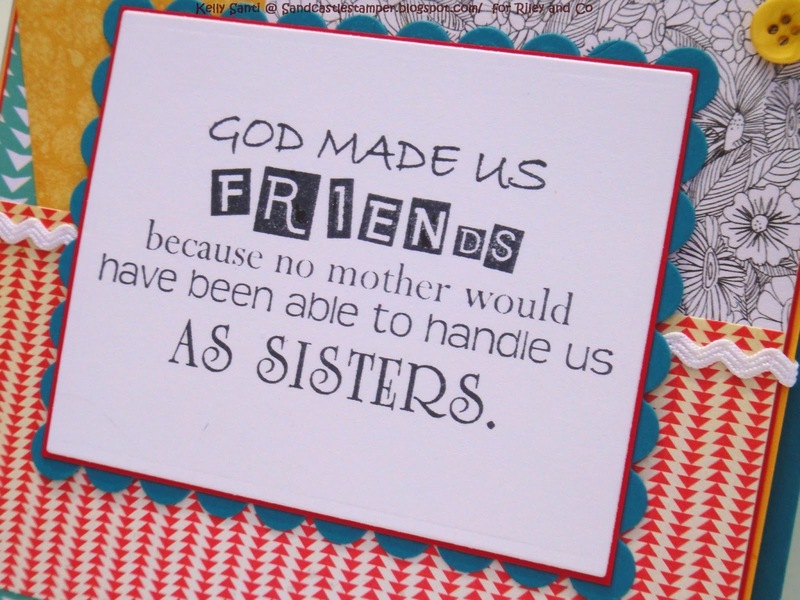 Hi Faith sisters! This month’s Crafter’s of Faith challenge theme is inspired this verse and your theme is: Water ! It’s summer and many of us are enjoying the splendors of the outdoors – boating, swimming, walking along the lakes and rivers. Summer rains, as heavy and burdening as they can sometimes be, bring us new growth all around ~ trees, green grass and gorgeous flowers blooming. Even spiritually, many people accept Jesus into their hearts and become baptized in water and have beach baptisms. Water is a beautiful, healing, essential! This month, I want you to use WATER as your theme on your cards: Be as creative as you like - think boats, oceans, the beach, tilted watering cans, bird baths, falling rain, etc! Let water be the focus of your card and extra brownie points for using the color BLUE !! Blessings! 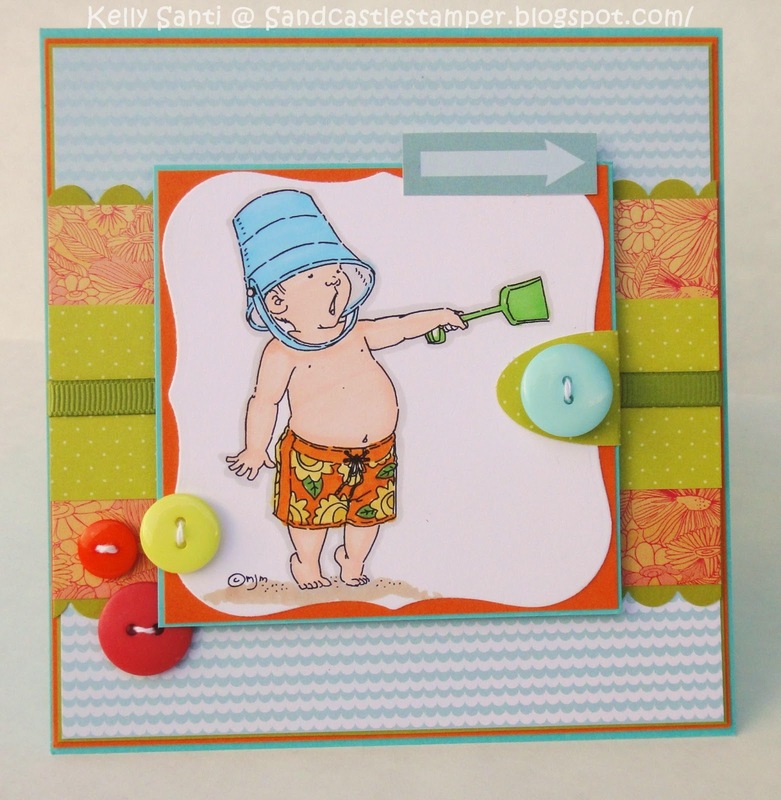 For my card, I stamped up the ever so lovely "The Mighty Sea"
all in my sidebar and see how they did with this month's challenge! Smiles to you this day! I have soooo many stamps that are cute and cuddly, and probably tops the list of what I own in stamps! I would like it to be "Cute and Cuddly". The cuddly being a huggable moose, or a raccoon, or a bear, etc. I really enjoy the Riley stamps and Penny Black hedgehogs, but I'm asking you to pick your favorite furry creature stamp and make a card with any sentiment. I happen to be a hoarder of cute stamps, maybe because my kids share in my stamping addiction. 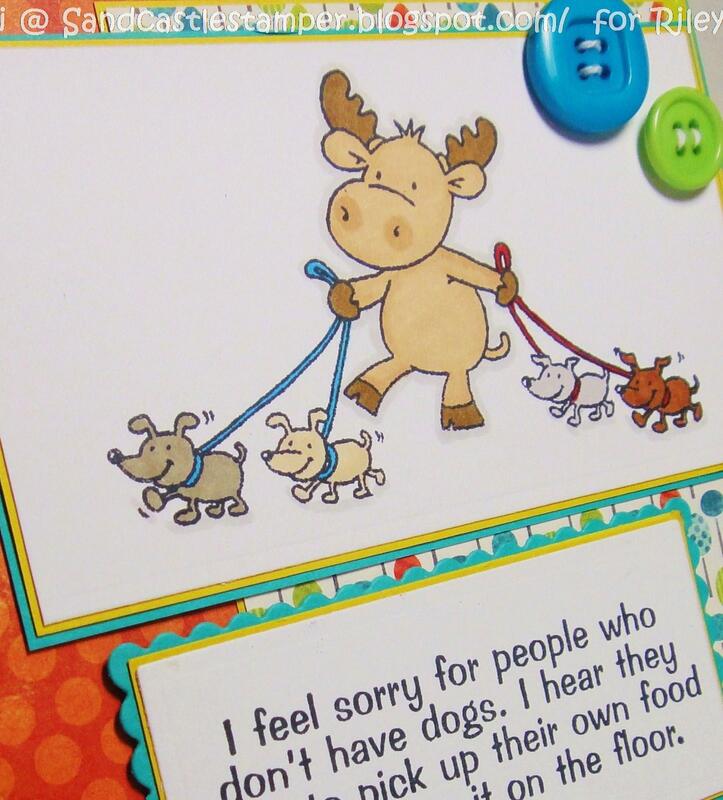 It's always fun to see those little critters come to life on a card. in California and the neighboring farms - vast, vast farmlands! For me, it just evokes such incredible happiness. 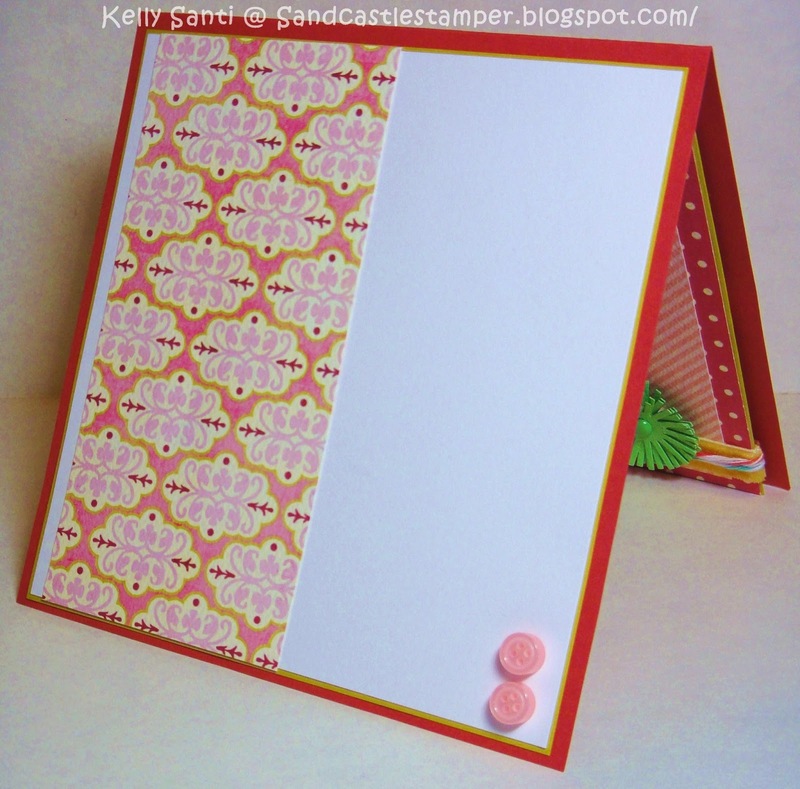 For my card, I used a digi from Bugaboo stamps. I created the card base, paper choice and layout based on the image. little like a Valentine's card, right?! 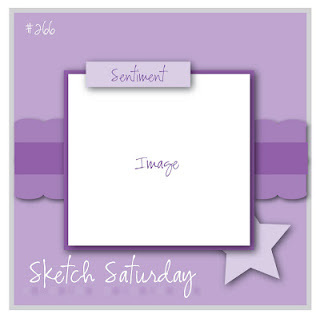 LEJ Designs 63 - Cute! I have SO loved seeing so many Christmas in July cards on blogs, in the shops, and challenges aplenty. Even though Miami is sweltering with heat and humidity, it's always fun to think of Christmas all year long! I've had this Penny Black "Xmas in pond" stamp for ages and as part of my LINY card year, inked it up! I completely got into my *Christmas mode* with the stickle hats, holiday inspired paper, and one of my FAVORITE Christmas color combos: Old Olive, pink and red! Also, I love Pro markers has a Christmas in July challenge so I'll play along! Thanks for stopping by and HOPPY Holidays! of rain and more rain - the sun is out, the kids are jumping in and out of the pool while I sit in my lounge chair nearby .... glorious! Summer! 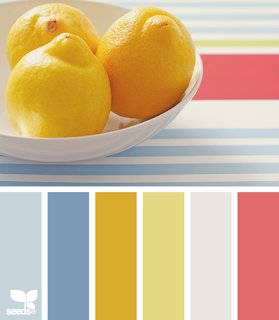 For a bonus, we'd love for to use the color yellow somewhere on your card - easy peasy! I inked up Hammock Riley, colored with prismacolor markers and used some papers that I had left over from recent card making. In the inside, I added one of my favorite Riley stamps - "You can never have too much Happy!" We'd love for you to play along! 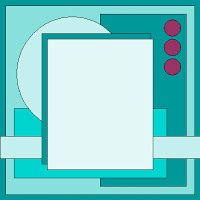 To play, create a card using a Riley and Company images. If you upload your card to a gallery, please use the keyword Riley1513. 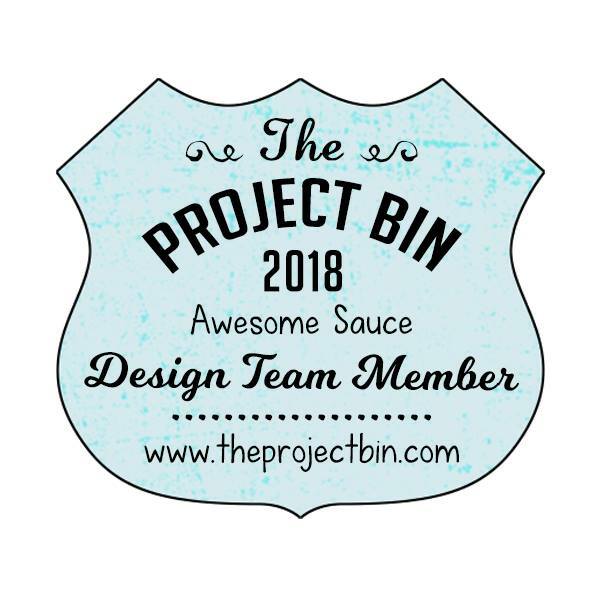 To see what the rest of the DT created today, please check out their blogs for more yummy Riley and Company creations, and of course, link up your cards to the challenge blog! Sending big hugs and hope your day is filled with sunshine and cheer! 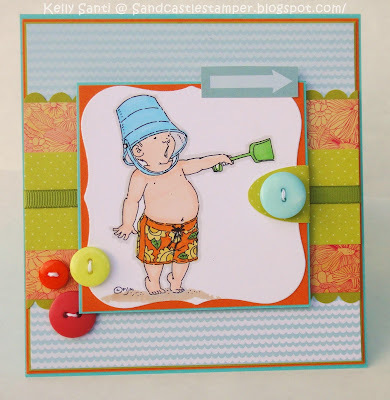 C is for Challenge - Summer! While I was crafting, safe from the rains falling softly outside, I was thinking of the trip we took to Europe several years back, specifically London. We were touring the city with 4 kids, all under the age of 10, yet the city was so majestic! We wandered through the lovely Kensington Gardens and I thought how absolutely stunning ~ what a moment to connect with the beauty of God's earth. So much peaceful and tranquility. The world, for that moment, was just still. Ah, lucky is the person to be able to hop on a plane and just be where you long to be! For my card today, I finally colored up this sweet little flower that has been in my image stash for ages. Even though I colored it red (I'm thinking this is a poppy? 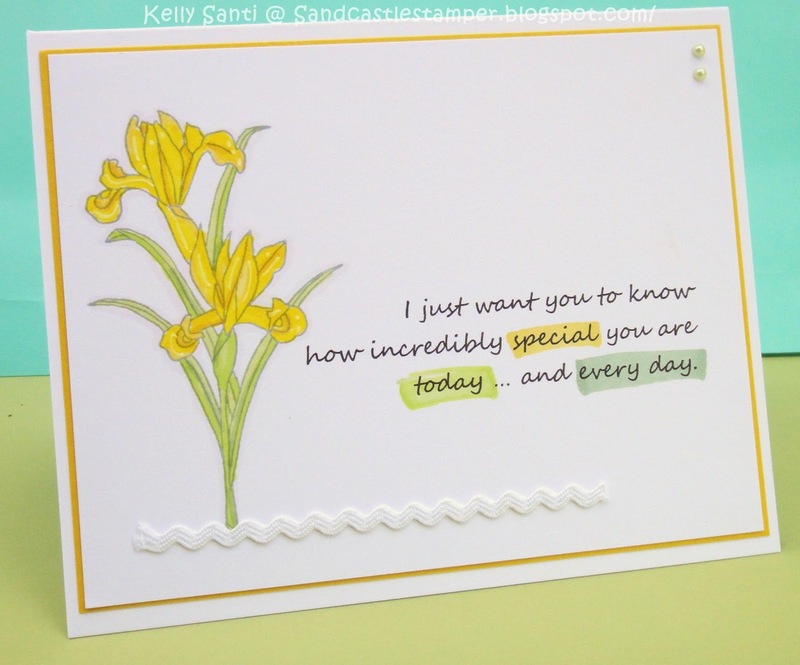 ), I wanted the flower to stand out on it's own and chose a lighter, softer dsp collection from Cosmo Cricket. It's pretty simple overall but for some reason, it just felt finished when I added the simple embellishments. I'll enter this card to: Art Impressions Challenge 117 - Twine Time! It's Riley's *New Stamp Release* Blog Hop! Hi friends! The day is finally here!! 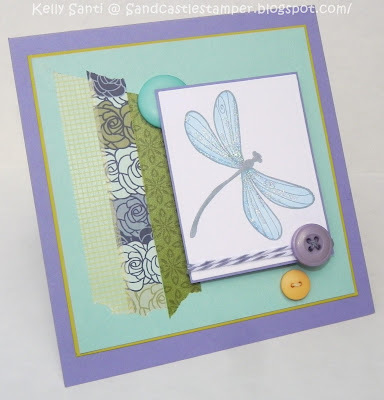 It's time for the new stamp release at Riley and Company! I'm super excited to showcase two new Funny Bones stamps today, in addition to the 33 others being released in the store. That's 35 brand new Funny Bones stamps in total - so much fun! If you are hopping along, you should have arrived from Frances' fabulous blog. If you just arrived, and you want to hop from the beginning, please start here. 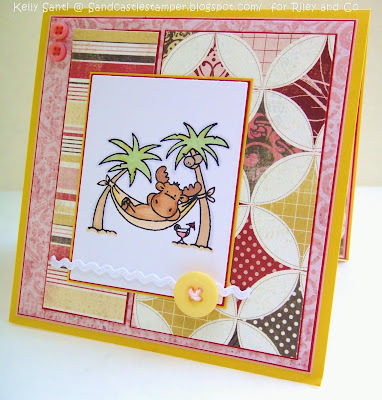 There will be two winners tonight along the hop, as well as some fabulous eye candy cards on each designer's blog. Next up, I have a bright, sunny card using "Leaves a trail of glitter" and let the sentiment be the focal point of my card. I added some glittery to the butterfly that coordinates the papers used and added some additional bling off to the side. As crafters, isn't it magical on the days we can get our hands inky and glittery! 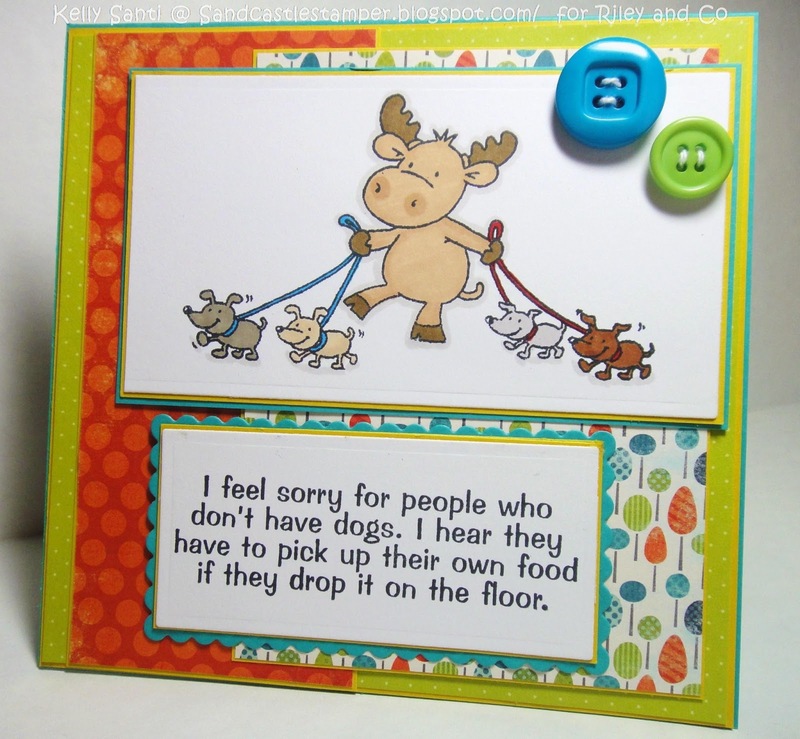 From here, you'll hop on over to Laurie's lovely blog to see what she's created with the new Funny Bones! I hope you get the chance to hop along with us. And may today be a day of leaving a trail of glitter, wonderful and all things fabulous for you! There are some specials going on right now, straight from the desk of the head moose, Tanya! Riley Sneak #5 ~ Friends! Hi friends! 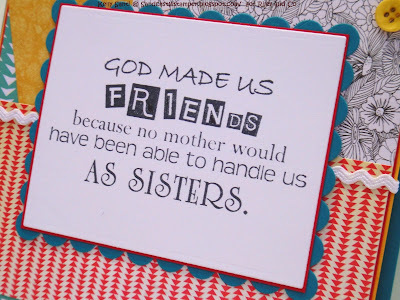 I have another sneak peek for you today using a new Funny Bones sentiment "God Made Us Friends", which is being released TONIGHT at the Riley and Company July release Blog Hop. I'll also enter this card into the Paper Pretties Challenge #267: "tongue tied ~ use a sentiment as a focal point"
and to The House that Stamps Built Challenge: Use Humor! Hi friends! Aren't the new Riley and Company Funny Bones stamps absolutely hilarious! Oh how they have me chuckling ~ each one is so hysterical and there is a huge batch of them about to be released ... 35 in total! Puppies can be funny, too - just ask our Buster! A few weeks ago, he pulled his dew claw nearly off while chasing a toy ~ ouchie!! He had to have it cut down, bandaged and since he wouldn't stop chewing at it, had to sport this absolutely funny looking collar, bless his heart! Don't we love our puppies! Just a quick reminder that our Blog Hop begins this Thursday, July 18th at 10 PM EST! 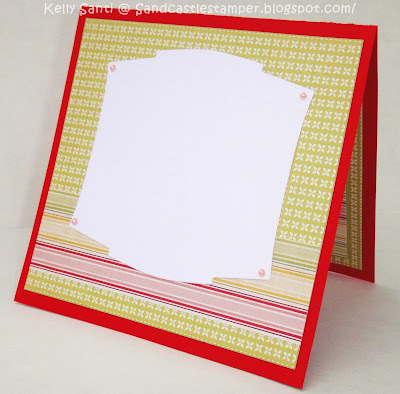 Be sure to stop by the Riley and Co DT blogs to see what sneak peeks they have up for you to see. Riley Sneak #3 ~ I'm SUPER lazy! Hi there! Welcome to day 3 of the Riley and Co sneak peeks! stamps as I have! They are an absolute riot! 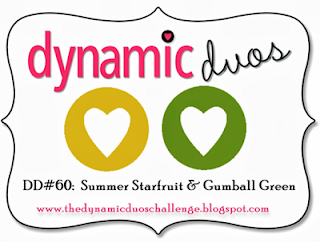 so be sure to come on by every day for the sneak peeks AND for the wonderful blog hop - 10 PM, EST, Thursday: July 18th! For today's card, I used the FB sentiment super lazy and paired it with Riley Batmoose! First up, the sneak peeks continue at Riley and Company where 35 fabulous new Funny Bones stamps are about to hit the store! Exciting! For my card today, I used the new Funny Bones stamp "Seeing a spider" and paired it with Miss Muppet Sophie ~ eek is what I'd say! Luckily, this little spider is as cute as can be! Please be sure to stop by the rest of the Riley and Co DT to see what sneaks they have for you today! 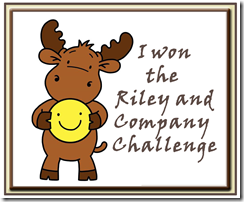 And in case you wanted to play along, you still have time to enter your cards in the biweekly Riley and Company Challenge at the blog. The challenge this week is to use Sophie on your card, keyword 1413. Also, just as a reminder, the Riley and Company blog hop will be at 10 PM EST on Thursday, July 18th! Hope to see you there!! 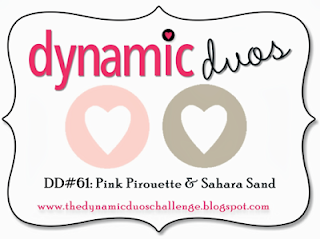 Next up, it's the 15th of the month and that means the Dueling Darlings post our cards created from the kit sent to us by the monthly hostess. This month, our hostess is the fabulous Barb! Her kit was absolutely delicious and she was so generous with the gorgeous supplies ... I can easily make another 2 cards with her kit! Using the image she sent to us, I colored it up with my prismacolor markers and used the brightest, boldest and most fabulous papers of the kit ~ love these fun, summery colors! She sent us the Whipper Snapper Ice Cream bear image to color along with a plethora of ribbons and embellishements, it was really hard to chose! I used a scrap of one of the front papers to add a little to the inside of the card. 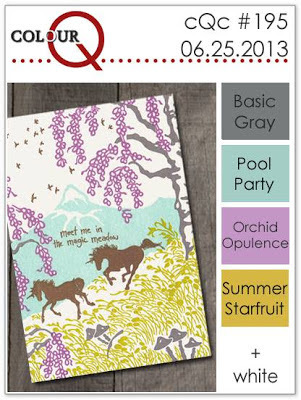 I supplied the cardstock for this kit and used the In colors: Primrose Petals and Summer Starfruit ... exactly what color is Summer Starfruit? I love it! I can't tell if it's a yellow or a green or a little bit of both! I hope you get the chance to stop by the rest of the Dueling Darlings blogs and see what they made with this card kit! We are home again from this summer trip and had a wonderful, blessed trip. We ate more foods than we should have, walked a bazillion miles rode and rode and .... rode more rides! :) We have an definitely passed on our adventurous spirit to our kids. We missed our oldest, college daughter terribly ... with her full schedule, she simply could not take the week off but it's fabulous to all be together now! from the new, soon to be released Funny Bones stamps! There will be 35 new stamps released! For today's card, I'm using the sketch from CTS #36 and the color scheme from Dynamic Duos #61! Remember to check the Riley and Company DT blogs for more sneak peeks every day! Our Blog Hop begins this Thursday, July 18th, at 10 PM EST and will begin on the Riley and Company blog. Thanks for stopping by - I'll be by to visit you soon! Riley's new Challenge ... Sophie! 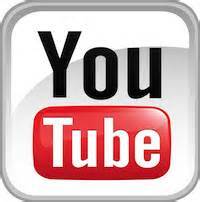 To enter your cards, please stop by the Riley and Co Blog. Be sure to stop by the DT blogs to see their creations this week! use the keyword 1413 - we'd love to see what you created. A flower a day keeps the ...... snow away! 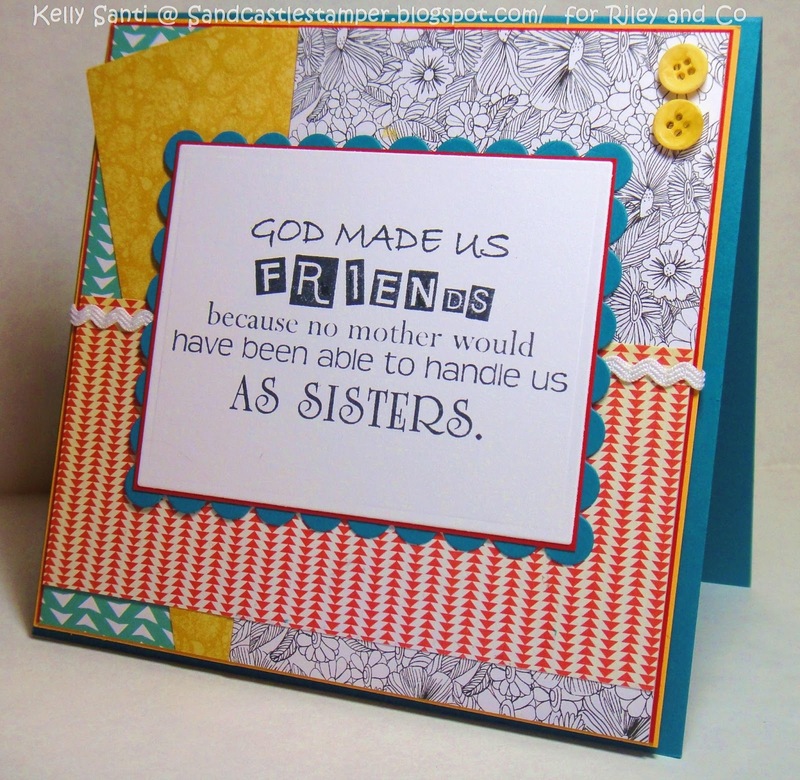 I thought I'd share the card I made for the SOTC (card group on SCS) ~ our hostess this month is Maryann. Bless her heart, Maryann has had her share of snow and more snow - and asked us to create a card with flowers to bring out the sunshine! I actually created one, totally CAS, and then read her requirements to include at least one embellishments, so in order to keep the CAS look, I added a dallop of ric-rac and some tiny pearls in pale yellow. Here was the original: just a subtle difference, right? 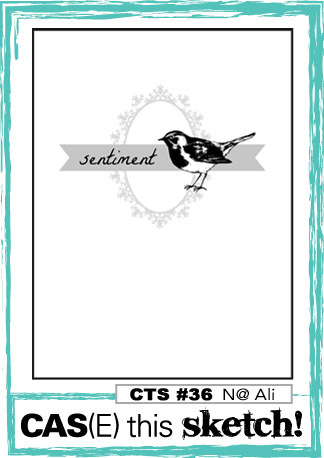 I'm trying to embrace the crisp, CAS look of cards and have these wonderful ideas - then put them 'on paper' and it just falls flat ... no pun intended! 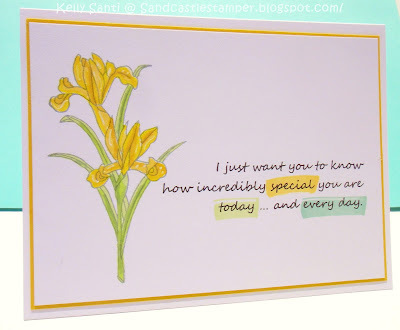 :) I thought Bridget's card was stunning in blue, but really wanted to use yellow - to represent sunshine and to make it cheery. 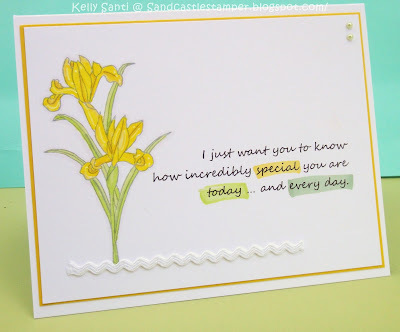 I also had fun playing with one of my old stamp sets again as per my crafting goals, like this one from SNSS from their February flower of the month (Iris) collection. Thanks for stopping by today ~ have a great rest of the weekend! I had a little time to get crafty today - Yay! My son is so cute - he loves to stop in my craft Cabana and ask if there is something he can color, if there are any paper combinations or embellies he can pick out - like these buttons! I adore Mo Manning images and this one called Nesto just makes me smile every time I color it up! The challenge on the blog this week is "F is for ..." and I chose fUn! 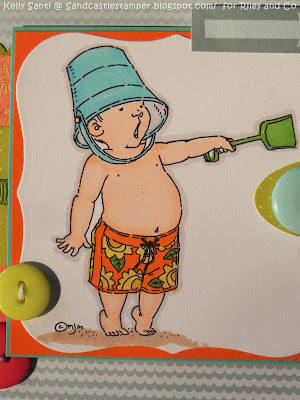 After all, wearing a beach bucket on your head and being at the beach surely is FUN! 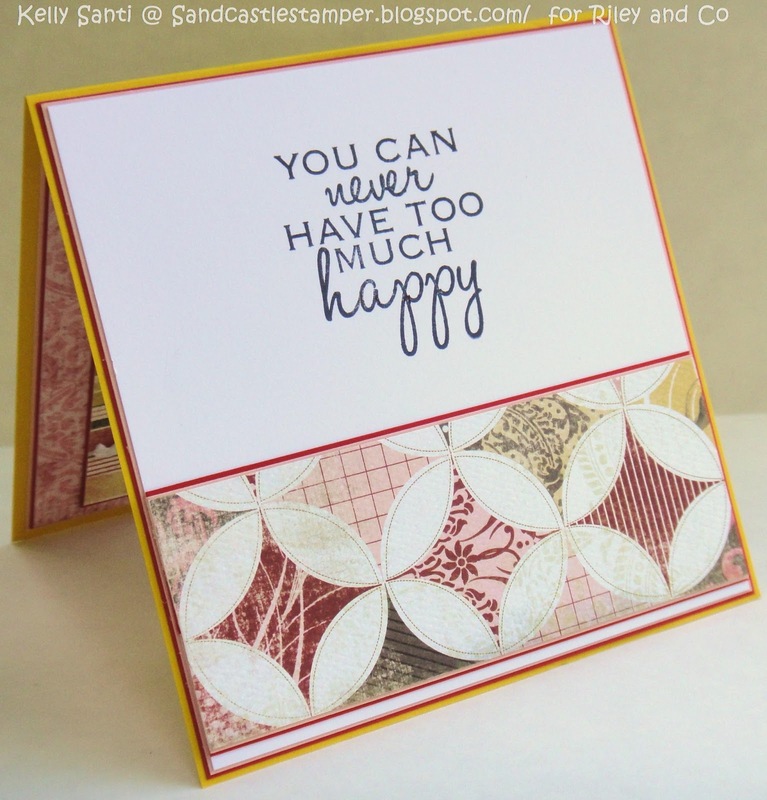 :) I pulled some Sundrifter papers from Studio Calico - oh this is so luscious, I am already awaiting my next card with this pack! I chose these papers to match the colors of his bathing suit. 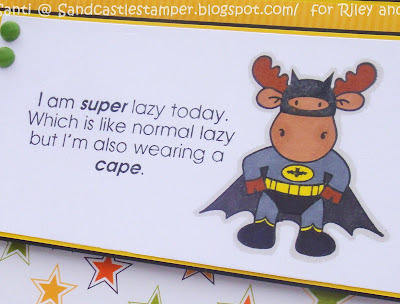 I'll enter this card into Mo Manning's challenge #192 "For is for ..."
That's it for me for today! I hope you had a fabulous weekend! And wow -- where did June go?! The challenge this month was to use washi tape.